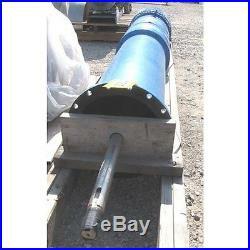 ITEM #: 11905 GOULDS 2-STAGE VERTICAL TURBINE PUMP - MODEL 16DHLC (Parts) SERIAL NUMBER: 472903. STANDARD CAST IRON BRONZE, FULL TRIM IMPELLER. SPECIAL OFFER: Choose to pay with check or wire transfer and be eligible for a 3% discount on your entire order. Please be aware that we do accept Personal checks. Skidding/Crating available at additional cost. Items are also listed on other venues and are subject to prior sale. The item "GOULDS 2-STAGE VERTICAL TURBINE PUMP MODEL 16DHLC (Parts)" is in sale since Friday, November 20, 2015. This item is in the category "Business & Industrial\Manufacturing & Metalworking\Process Equipment\Other Process Equipment". The seller is "jmiwv" and is located in Millwood, WV. This item can be shipped to United States.